For many, hip-hop’s heyday was the so-called golden era of the late 80s to early 90s. The likes of Public Enemy, A Tribe Called Quest, NWA, Eric B and Rakim, Jungle Brothers, BDP, De La Soul, Redman and their many peers broke new ground with every release, bringing quality rap music to the mainstream without compromising its message, ‘realness’ or - most importantly - unique musical styling. It was a far cry from the massive, hyper-commercialised industry it ultimately gave rise to. Crucial to the rapid development of hip-hop at that time was the arrival of the relatively affordable sampler. Game-changing boxes such as the Akai MPC60 and E-mu SP-1200 gave producers the ability to sample phrases and drum hits from vinyl, turning the breakbeats and licks of classic funk and soul cuts into raw material ripe for reworking into whole new grooves. Drum machines still had their place, certainly, but sampling caught the imagination of the hip-hop producer like no technology before or since. In this walkthrough, we’ll show you how to make a classic MPC-style hip-hop beat. We're using Ableton Live and its built-in Drum Rack instrument, but any DAW and software sampler will, of course, do. Step 1: The first thing to do is select some suitable samples. With a Drum Rack loaded in Ableton Live, we embark on a search for that classic 90s hip-hop combination of punchy kick, phat snare and crunchy hi-hats. Eventually, we find solid candidates for all three in a very old sample library. Step 2: Our kick drum sample includes an unwanted high-frequency click, which we get rid of by applying a Low-pass filter at 9kHz, with a little bit of Resonance. The snare comprises two layers. We move the sample start points of both right to the starts of their waveforms, to get them landing at the same time. 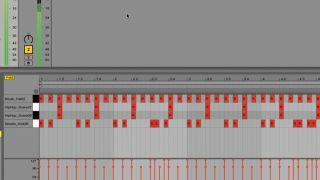 Step 3: Now to program the beat. We start with the hi-hats, entering a series of eighth-notes - it couldn’t be simpler! The late start point of the sample in the Drum Rack gives them a hip-hop-appropriate laid-back feel. If your sample is bang on time, apply an offset in your sampler or drag the MIDI notes a fraction to the right. Step 4: The kick and snare bring the ol’ boom-bap with a straightforward backbeat in the latter and a repetitive, driving eight-bar pattern in the former, phrased with extra 16th-note kicks every two bars. At this point, we're programming to a straight grid, so the requisite hip-hop swing is notable by its absence. Step 5: It’s easier and more authentic to apply swing using your host DAW than to manually program it yourself, particularly if that system includes groove templates based on classic hip-hop beatboxes such as the Akai MPC. Live’s MPC-16 Swing 66 template, applied at 66% Timing, gets our beat sitting exactly where we want it. Step 6: Finally, a fill. In old-school hip-hop, drum fills were either sampled from vinyl and cut in where required, or tapped directly into the MPC using sounds already loaded for the main groove (usually kick, snare and hats). This lolloping kick drum, with a snare at the end to reintroduce the groove, is an East Coast classic.